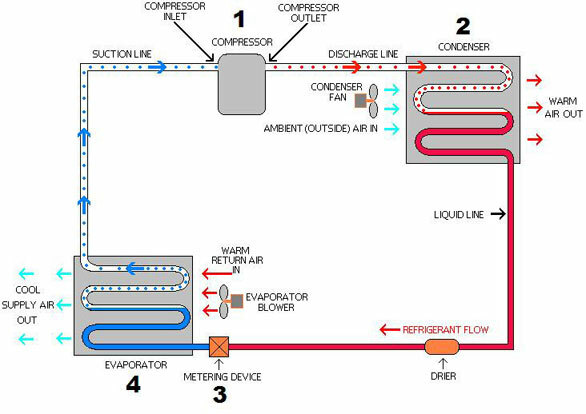 Ammonia refrigeration systems are common in food industry and can provide cooling at varying temperature levels via evaporator coils in different locations by use of a centralized ammonia compressor system. Typically, the heat absorbed by the ammonia in the various evaporators is rejected through cooling towers on the high pressure side of the system. Slightly superheated ammonia from the evaporator(s) at low pressure enters the compressor suction inlet (1) and is compressed to a high pressure. The high-pressure, superheated ammonia enters a cooling coil (2), which may be tied to a evaporative cooling tower, to condense the ammonia to a liquid and in so doing rejecting the heat from the refrigeration cycle. The resulting high pressure liquid is flashed to a low pressure (3), and the remaining low pressure liquid enters the evaporator(s) to remove heat from the refrigerated space(s) (4). Ammonia refrigerant will exit the compressor as a superheated vapor and is then sent to a cooling tower to be converted to a saturated-liquid state. Instead of dumping the thermal energy released during this process to the atmosphere, a heat exchanger (in this case, a de-superheater) can be included in the loop to remove a large quantity of the heat from the ammonia. This excess heat can be used in other processes such as preheating combustion air for a boiler system. While the pressure of the ammonia leaving the compressor needs to be above a certain level in order to maintain the cooling load of the system, excess pressure will result in energy losses. The system's compressor will consume more power in order to compress the ammonia to the higher pressure. This will also generate more waste heat from the process of condensing the superheated ammonia to a saturated liquid state.